HAYS, Kan. – The Fort Hays State University Interfraternity Council recently attended the regional conference of the Association of Fraternal Leadership Values in Indianapolis. The IFC was honored for their “Take a Stand” campaign against sexual assault. 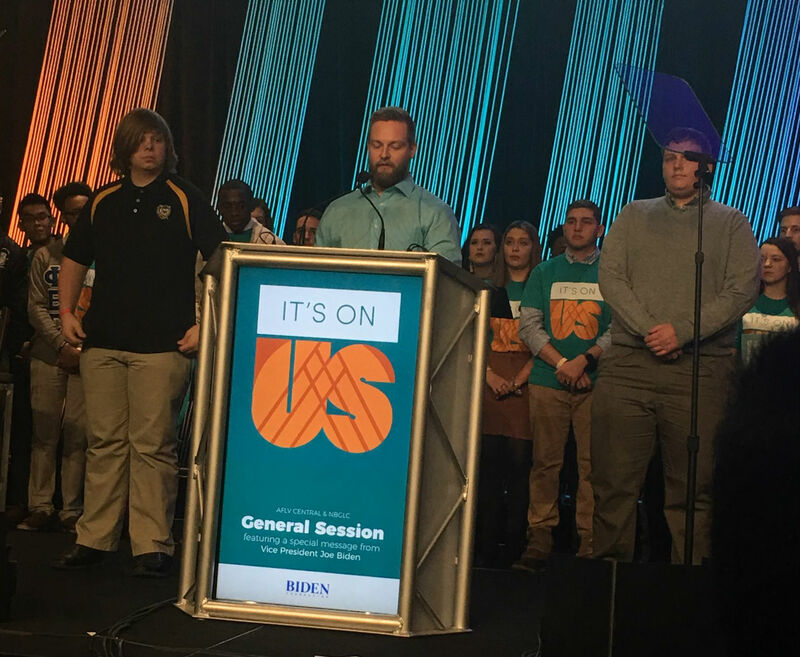 Stephen Hopson, FHSU’s coordinator of student involvement, along with two IFC members on stage with him, spoke to the convention shortly before former vice president Joe Biden spoke about their work on prevention of sexual assault and violence. Biden worked closely with the “It’s On Us” campaign, a national movement to help stop sexual assault. Hopson was accompanied by Garrett McBlair, Beloit junior, and Zach Barker, Sharon sophomore. McBlair, a member of Sigma Alpha Epsilon, is the IFC’s vice president of records and finance. Barker, Alpha Gamma Rho, is the IFC’s vice president. FHSU’s “Take a Stand” campaign was developed by Jacob Brubaker, Bird City senior, a former IFC vice president of member development and a member of Alpha Gamma Rho. The program was facilitated in the fall of 2017 by Jacob Ternes, assistant director of FHSU’s Memorial Union. From around 90 applicants, the IFC was one of the four selected to share the story about their sexual assault and violence prevention programs around campus.